NEWLY RENOVATED!Come experience the perfect choice of Mt Pleasant. 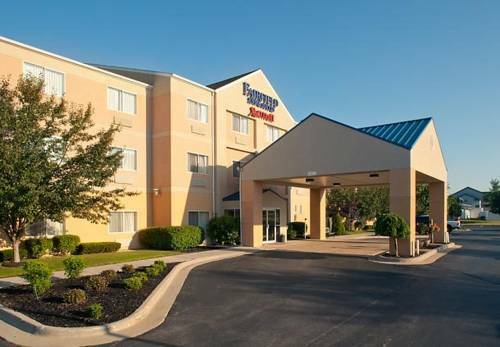 Whether you are here for business or pleasure, impeccable service and an unbeatable location on Central Michigan University's campus - we're the Fairfield Inn & Suites by Marriott and we're near it all. Surrounded by 14 area golf courses such as the award winning Bucks Run, Pohl Cat, St. Ives and Tullymore. We offer shuttle service to the Soaring Eagle Casino, Mid-west's largest casino, just minutes away. Upon arrival, you'll be greeted by our high class associates who specialize in taking care of your needs. Our elegantly appointed guest rooms and suites - a haven for relaxation - offer luxury bedding with fluffy pillows and soft linens, free high-speed Internet and large work areas. After sightseeing or meetings, enjoy delectable Irish-American cuisine at Bennigan's Restaurant next door. ~59 miles from Mount Pleasant. Exhibits the pen he used to pardon Nixon, and the .45 Colt pistol used by "Squeaky" Fromme to try to kill him. On the grounds are the side-by-side graves of Gerald and First Lady Betty Ford. ~62 miles from Mount Pleasant.